a) One model of information processing that helps in the understanding of short-term memory, is the “Working Memory Model,” proposed by Baddeley and Hitch in 1974. This model aims to explain how short-term memory works. Short-term memory is an aspect of human cognition, which is believed to have a short term memory duration, lasting approximately 15 and 30seconds, if it is unrehearsed. Short-term memory is a separate memory store from the long-term memory store. Hence the Working Memory Model focuses on explaining the functions of the short-term memory. The Working Memory Model consists of 3 major components; the central executive, the phonological loop and the visuo-spatial sketchpad. Firstly, the central executive plays a role in organising and distributing information gathered from the long-term memory. It has a limited capacity, and it connects the various functions from the other two components of this memory model, hence it controls the phonological loop and the visuo-spatial sketchpad. The phonological loop is another aspect of this model, which consists of two parts. The first is the articulatory control system. It is also commonly known as the “inner voice”. The role of the articulatory control system is to repeatedly rehearse information internally, not verbally. Hence materials are sounded mentally, to oneself. The other component of the phonological loop, is the phonological store. This is also known as the “inner ear”. When information is spoken, it lasts approximately 1.5 to 2 seconds, if it is not refreshed by the articulatory control system. The “inner ear” can also receive information directly through the sensory register (echoic) or the long-term memory. Another part of the Working Memory Model, is the visuo-spatial sketchpad. This component is known as the “inner eye”, which is responsible for visual and spatial information. It is a temporary store for visual and spatial information. Once again, like the phonological store, the visuo-spatial sketchpad can receive information directly through the sensory register (iconic) or the long-term memory. The Episodic Buffer is a small component of the Working Memory Model, which responsible in linking up the phonological loop, visuospatial sketchpad together. The main reason that this component was added was because amnesia patients have good short-term recall of stories. Much more information is recalled from the phonological loop than possible, hence, it was believed that the episodic buffer could have played a role. The Working Memory Model by Baddeley and Hitch is a model of information processing which tries to explain the function of short-term memory in human cognition. This is illustrated through the 3 major components: the central executive, the phonological loop and the visuo-spatial sketchpad, and also, a minor aspect of this model is the episodic buffer. Thus, the Working Memory Model helps in understanding short term memory. b) A strength of the Working Memory Model developed is that it based on sound scientific research and psychological theory. 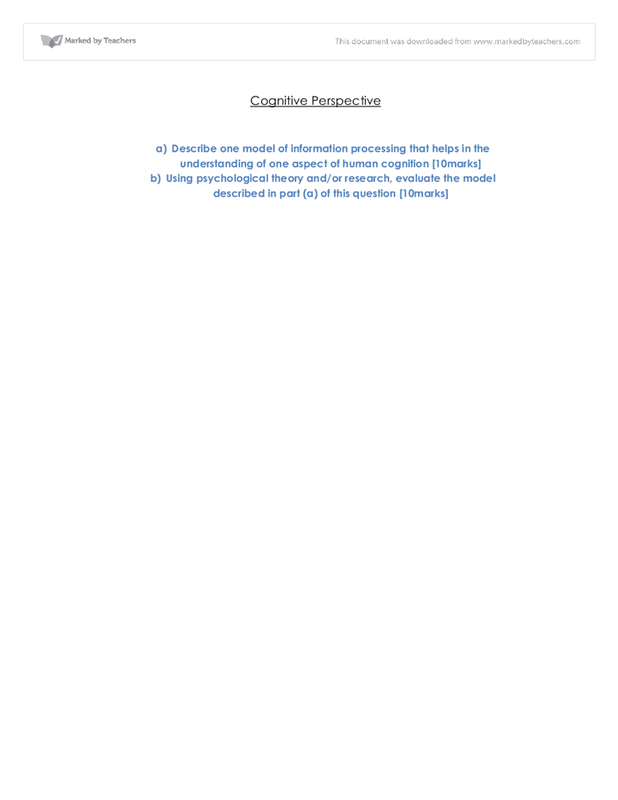 In the cognitive perspective, there are several empirical studies to support this model. For example, Baddeley’s 1966 experiment investigating the effects of acoustic and semantic word sequences on short-term memory illustrates how information is processed and stored. In the study, participants were given lists of acoustic or semantic word sequences. The results showed that there was higher mean percentage recall for the semantic group, compared to the acoustic group which had a lower percentage, Baddeley suggested that the participants “spoke” the word-sequences to themselves, in their head. This is explained in the Working Memory Model as the articulatory control system, or the “inner ear”. The study was a laboratory experiment; hence it had well controlled variables and a distinct independent variable, allowing cause and effect to be determined. A case study on an anterograde amnesia patient, known as “K.F” supports this model. K.F. had a severe motor-cycle accident, which resulted in brain damage in his left parieto-occipital region. Consequently, K.F. had problems with his short-term memory, letters and words with significant sounds, such as “doorbells” and “cats meowing”. Despite this, other components of his short term memory were unaffected, as he was able to form visual long term memory. Hence his visuo-spatial sketchpad was not destroyed. This case study on K.F. supports the Working Memory Model rather than the Multi-store model. The Working memory Model has high ecological validity, because it tries to explain how short-term memory works in a real-life situation. It is also based on real case studies, like the study on K.F. This model seems applicable in a real-life situation, for example, if a person would like to remember a phone number, they would picture the number and rehearse it.This complies with the different components of the Working memory Model. This model is more “active” and “interactive”. It tries to explain how the different components interact together to help short-term memory. It is not unitary, like the Multi-store model by Atkinson and Shiffrin, which is rather passive. Hence, the model is not reductionist, as it does not try to simplify a complex behaviour, such as short-term memory, into a simplistic model. The Working Memory model also consists of the Episodic Buffer. This component tries to explain how we remember orders of events. This aspect illustrates a limitation of the model as is not yet clearly understood; hence it requires more research to understand the major role of the Episodic Buffer. Similarly, the role of the central executive is still vague, and requires more research to understand its role. Similarly the Central Executive is also not well understood. The Working Memory model is based on studying cognitive processes. However, these processes are difficult to measure properly, as it is not observable. Some of the empirical studies are laboratory-based; hence it does have a limited ecological validity. However, the research has tried to overcome this, by focusing on real life examples, such as case studies like K.F. Cross-cultural studies have suggested that children who were not schooled did not have the same learning skilled as a child who has gone to school. For example, the non-schooled children did not develop “chunking” or categorising information, hence is suggest that schooling affects how our memory works. (Cole and Scribner) Thus, it would affect how one’s short-term memory would function. Hence, empirical research in the cognitive perspective has played a role in the development of the Working Memory Model by Baddeley and hitch. There are several strengths and limitations associated with this model of information processing. Thus, the Working Memory Model tries to explain how short-term memory works, and it has triggered considerable further research in this area, in the cognitive perspective. What is Memory and What Causes Memory Loss? Background Music on Memory Recall Kayla and Jaydon Thank you for taking the time to participate in this study. The following details are provided to inform you about the project. Please read this statement carefully and feel free to ask any questions that you have at any time. This could be observed in free recall studies where participants recall words in the same order despite changes in their presentation. He suggested subjects organized their material even when organization was not imposed. Mandler (1967) said that 'if you organize something, you will learn it'. (see figure 1.4) Another theory known as the interference theory suggests the possibility of taking in and storing new memories that interferes with the ones already recorded. A third possibility is that the process of retrieval breaks down. In other words, the brain cannot find the pathways that lead to a stored memory. Gramsci's Marxism focuses on human subjectivity. He uses the term hegemony to denote the predominance of one social class over others. This represents not only political and economic control, but also the ability of the dominant class to project its ideology to subordinates who must accept it as 'common sense'. AD affects semantic memory as well. Semantic memory stores general knowledge about the world, concepts and language. Procedural memory is less affected. In fact, most of it is spared for most of the course of the disease. Thus, AD patients retain their knowledge of motor and cognitive skills such as playing the piano, riding bicycle or holding a conversation.